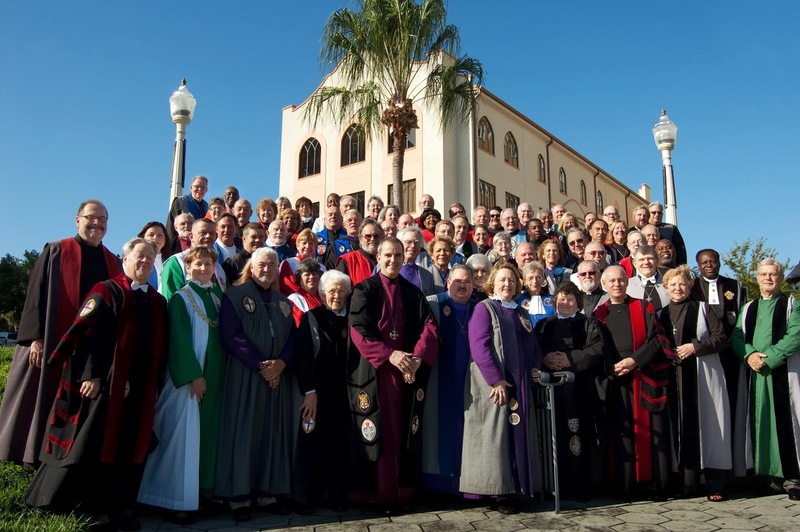 A total of Ninety three members and families of the Vergers Guild of the Episcopal Church met in Lakeland, Florida to enjoy true southern hospitality, inspiring conference sessions, and great food. Conference hosts Cheryl Cantrall and Sid Glynn from All Saints Episcopal Church graciously gave all attendees an experience to long remember. The board met in a working session during the day on Thursday. Approved minutes of that meeting and all other board meetings are available HERE. Margaret McLarty, President, Pat Allen, Vice-President, Bill White, Secretary, and Duke DuTeil, Treasurer. Scott Smith, Communication and Technology Officer, Cheryl Cantrall, Membership Secretary and Conference Host for 2012, Katherine Pendzuk, Training Course Registrar, and Chaplain, The Rev. Matthew T.L. Corkern. Fr. Matthew attended via a video hangout on an iPad. Topics included reports from various working groups within the VGEC, a review of General Convention and a commitment to take part in 2015 and beyond, the establishment of a free 6-month introductory membership category, Burlington Ontario as the 2014 conference location, initial design of the new Training Course Virge, new guidelines for handling conference budgets, and the formation of annual conference and bylaws subcommittees. "The Guild Today – General Convention"
Margaret McLarty, VGEC President, reported on the including church and Verger roles. She mentioned that a committee sanctioned at the General Convention is now working on revisions to the size of the General Convention attendance due to current criteria for delegate selection. A video presentation of the highlights of General Convention was prepared and is available HERE. Her address is also presented HERE. Scott Smith, Communication and Technology Officer presented a brief overview of the "got vergers?" 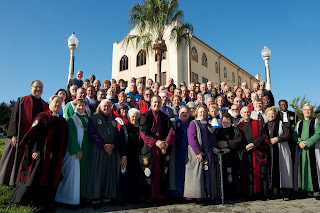 campaign for 2012 and the new "25 years of the Vergers Guild" for 2013. The presentation is available HERE. What is meant by "Ministry of Service?" Highlights from Verger 101 is available from VergerTV HERE. What do you do when it is time to not be a verger any more? This workshop answered that question and explored the various ways to deal with transition in the role of being a verger. Lunch: The Right Rev. Greg Brewer, Keynote Speaker. Bishop Brewer addressed survival of the Episcopal church in the 21st Century. He reminded us that God is a missionary God and to embrace that concept in your congregation. The complete presentation is available HERE. Several vergers gathered around the electric mixer, flour, and ovens to learn about Duke's recipe for his honey wheat Eucharistic Bread. The bread was a tortilla recipe with several practical adaptations and, it does not crumble. Duke demonstrated how to use simple ingredients and common sense to make this great Eucharistic bread. The presentation is available HERE. The Guild Bylaws, were ratified as amended and are available HERE. Duke Duteil was re-elected for 2 year term as treasurer. Bill White was re-elected secretary for 2-year term. Minutes from this meeting will be approved and published at the 2013 meeting in Nashville. Lone Palm Golf & Country Club. Certificates and verges for course completion. Three lifetime member certificates awarded.